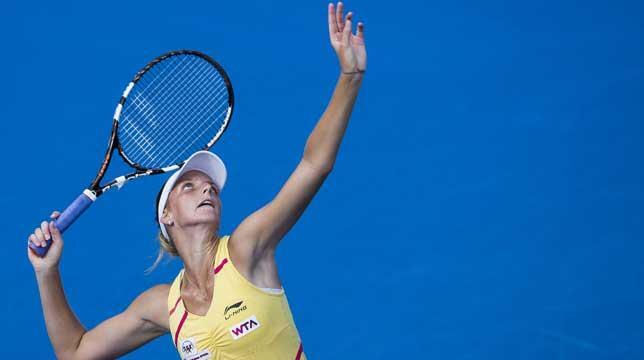 Grand gesture: Pliskova reached the third round of the Australian Open last month. She is a “young gun” that can surely become a “top-notch player” if she gets quicker, according to two-time grand slam champion Andy Murray. “Fun to watch, aces, winners, great timing,” the world No4 tweeted last month as he watched Karolina Pliskova take on Petra Kvitova in the Sydney final. It was a tight affair between the two Czechs and for most of it, you’d struggle to pinpoint which player was a double Wimbledon champion and which one was Pliskova – a huge-hitting up-and-comer who was looking to make her top-20 debut. Kvitova ended up winning that final in two tiebreak sets but it was Pliskova who caught the eye of many, including Murray and his three million Twitter followers. “The movement is probably the weakest side of mine but I’m still working on it and I hope it will be better. And I hope that Andy will one day say that I’m fast enough for him,” a smiling Pliskova told Sport360° ahead of her second main draw appearance at the Dubai Duty Free Tennis Championships. While the world No22 is yet to become a household name, Pliskova’s Sydney run certainly didn’t come out of nowhere. A week prior to that, Pliskova had taken out ex-world No1 Victoria Azarenka in Brisbane, carrying over the momentum from the end of last season where she made the US Open third round – eliminating world No9 Ana Ivanovic en route – before reaching the final in Hong Kong and picking up titles in Seoul and Linz. The 22-year-old is everything Murray said she is. She sports the kind of boom-boom tennis we’re used to seeing from her compatriot Kvitova and it looks like the WTA tour will have to make room for one more powerful Czech at the top of the women’s game pretty soon. “I’ve always been serving well. It’s my biggest weapon,” says Pliskova. Pliskova has a tennis-playing sister, Kristyna, and the pair made history together at Linz in 2013 when they became the first-ever twins to win a doubles title on the WTA tour. The twins had great success as juniors, with Karolina winning the Australian Open junior title in 2010 and Kristyna taking the girls’ singles trophy at Wimbledon the same year. But the twins learnt the hard way that having a successful junior career doesn’t necessarily translate into grand slam victories on the women’s circuit, and it has taken Karolina five years to reach the world’s top 20 and make the third round in the women’s draw at Melbourne Park – the site of her greatest triumph as a junior. “Juniors is a totally different competition so it was a little bit tough to come through after that knowing that you are a good junior, getting into the women’s game. Because no one cares that you won Melbourne, or that my sister won Wimbledon,” she says. In the solitary world of tennis, it must be a true blessing to have a sister who is also a professional player. While Karolina explains that she gets along well with everyone in the locker room, she knows she is particularly lucky to have her twin around. “I have a few friends, especially the Czech girls. But I don’t really need anyone because I have her (Kristyna). That’s why it’s the best thing to have a sister playing the same sport, having her around in the tournaments,” says Karolina, who is two minutes younger than Kristyna. But her recent leap in the rankings means she is now 122 spots higher than Kristyna in the standings and as their career trajectories diverge, Karolina admits things are getting a bit harder for her sister. “I think it’s more difficult now for her than for me because I’m still in the tournaments and playing well so I’m enjoying that time. But she has to get a little bit more up, get some points, win some matches and I hope she’s going to be in the same tournaments as me soon,” she adds. Karolina, who owns three WTA titles from seven final appearances, could very much have a major breakthrough this season. She was seeded at a grand slam for the first time in Melbourne last month and led the Czech Republic to a 4-0 sweep against Canada in Fed Cup last weekend – in her first nomination from her home country. She confessed that she felt a little pressure as a seed at the Australian Open but says she won’t pile any expectations on herself moving forward this season. “I don’t want to have any expectations from myself. I just want to stay in the top 20 or around 20 because I’m defending quite a lot of points this year and it’s going to be hard to stay there,” she says. On top of his game: Tomas Berdych thrashed Simon in straight sets to enter his second straight Rotterdam World Tennis final. 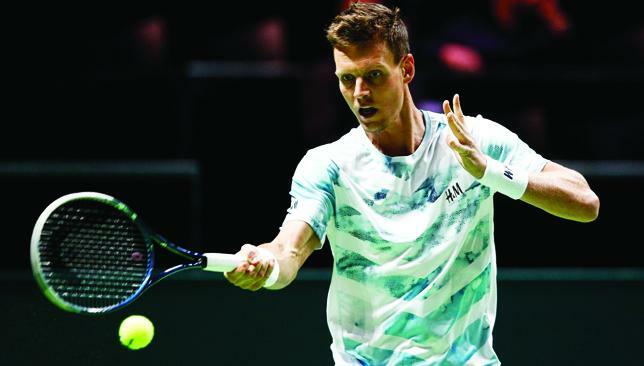 Tomas Berdych followed his game plan to the letter and reached his second consecutive final at the ATP Rotterdam World Tennis event yesterday with a crushing 6-2, 6-1 defeat of Gilles Simon. The rout, which took the Czech third seed into today’s final, lasted just 56 minutes. Berdych will meet Stan Wawrinka, who beat second seed Milos Raonic 7-6 (3), 7-6 (7). The Czech, now coached by Andy Murray cast-off Dani Vallverdu, said that he and his Venezuelan coach have been concentrating on strategy. Berdych stayed in total control as he swept to his ninth straight Rotterdam victory, losing only one point on first serve. He kept Simon on the back foot throughout the brief contest, with the eighth seed barely recognisable as the man who upset top seed Murray 24 hours earlier. “It’s good not to find anything wrong with your game,” said a satisfied Berdych. “It was a really good match, solid from the beginning. “And it all started with the right game plan. I felt very good on court, it was all positive for me. I was able to add something to my game. “I want to keep doing that for one more match here,” said Berdych, who ended with 14 winners and breaks on four of five chances. “I’m happy with how I handled it, with just the right amount of patience and choosing the right shots in the right moment. The Czech third seed wasn’t really tested by his French opponent in a match that lasted less than an hour at the Ahoy Arena. It was a disappointing performance from Simon who had a commanding win over Murray. During the match, Simon even appeared unhappy with the ball boys and even the towels made available on court. In the first set, Simon was out-hit by Berdych, who broke the eighth seed’s serve twice and allowed him just two return points. The situation wasn’t any different in the second set with Berdych easing to a 3-0 lead before Simon eventually got a game back, only to drop serve once more to let Berdych see out the match. Berdych won 22 of his 23 service points, hit 14 winners and converted four of his five break point opportunities against Simon. Pumped up: Stan Wawrinka had a four and 0 record coming into the game and now facesTomas Berdych in Sunday's final. Stanislas Wawrinka set up a showdown with defending champion Tomas Berdych after beating Milos Raonic 7-6(3), 7-6(7) in the second semi-final at the World Tennis tournament in Rotterdam.